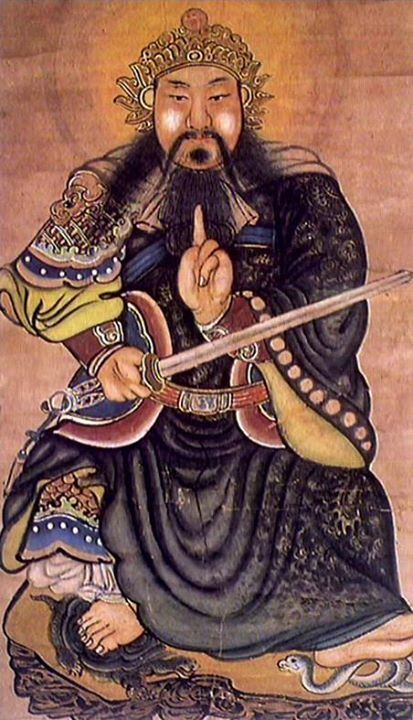 Xuan Tian Shang Di “Supreme Emperor of the Dark Heavens”, also known as Xuan Wu “Mysterious Warrior”, then later recognized as Zhen Wu “Perfect Warrior”, is the God of the Northern Realm of the Seven Stars. 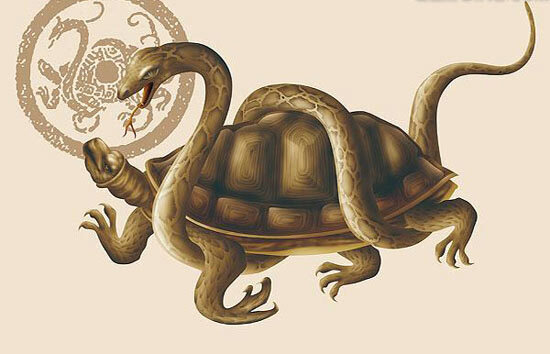 He wields the power of his totem animals, the Turtle and Snake, which also represent the direction North. It is said that Zhen Wu ascended to immortality in the Wudang Mountains of China. Many temples were built in his honor during the Ming Dynasty, by the Emperor Yong Le, who believed it was the spirit of Zhen Wu that aided him in conquering his nephew and attaining the throne. One of the most active and ornate temples built at that time and devoted to Zhen Wu is located in the Wudang Mountains; it is Zi Xiao Gong “Purple Heaven Palace”. 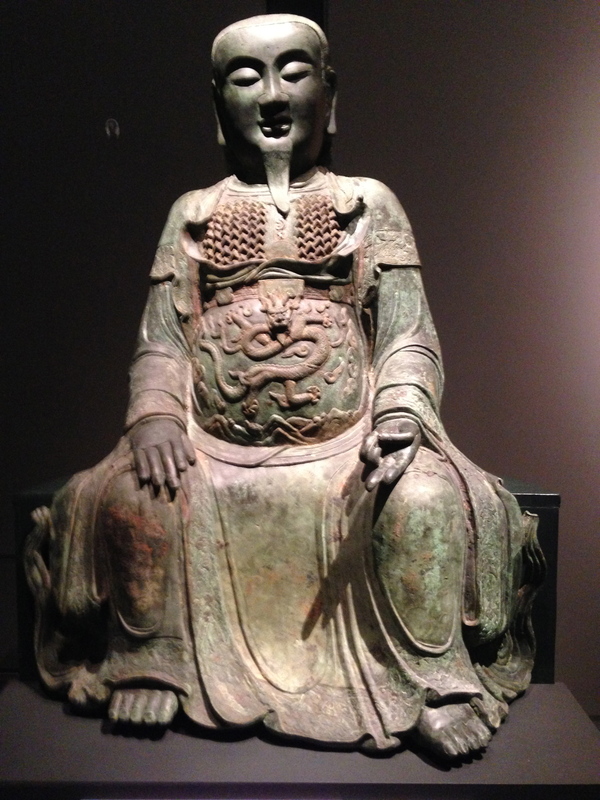 Zhen Wu is one of the highest deities in the Daoist Pantheon, existing in the dimension of the seven stars (Big Dipper), displaying great power with his chest of golden armor, upright sword in hand, often sitting in a throne with the Gui She “Turtle and Snake” beneath his feet. How does one encounter such a deity? How does one experience a communication with a higher spirit entity? Such encounters can happen naturally of their own accord at any moment, or through the summoning of ceremony or prayer. Often encounters will occur during sitting meditation, when one elevates their energy field or when one is in a sacred place. To become part of an authentic lineage is also an access point to communication with higher knowledge. I first experienced the spirit of Zhen Wu at the portal which exists on the Heavenly Horse Peak of Bai Ma Shan, Wudang Mountain Range. In the year 2011 was built the Jade Palace of Zhen Wu Da Di “Perfect Warrior”, sometimes colloquially called Zu Shi Dian “Hall of the Ancestor”. Prior to the construction of this jade and marble temple on the peak of the mountain, there was a small wooden shack with red flags flowing wildly in the wind, as there was a strong draft right there at the peak. The doors creaked and the wooden altar was rotted and dusty, often ragged red cloth draped down to cover. Plastic bottles of sesame oil offerings to the spirit lanterns were stacked under the altar along with yellow prayer paper, incense, candles; this is where we would many times find the old shed skin of a snake! 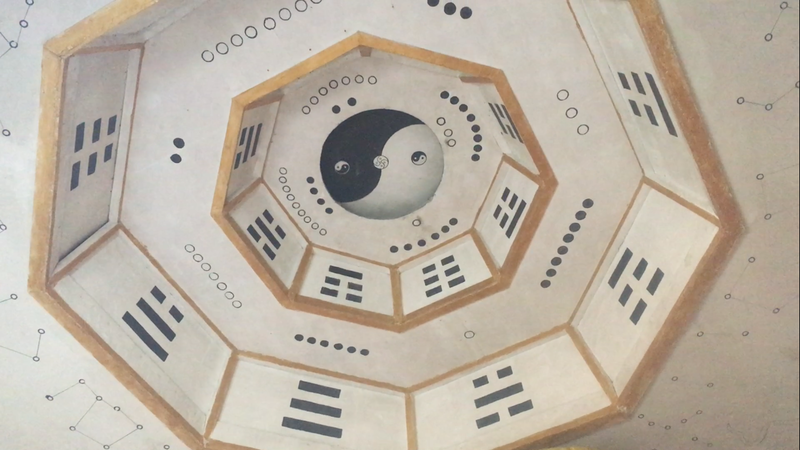 Both temples, despite new or old, held the same power, and a strong sensation of being in a Portal to another dimension. Often we run the stairs to the top to catch a perfect view of the sunrise and practice morning standing meditation in this sacred site. 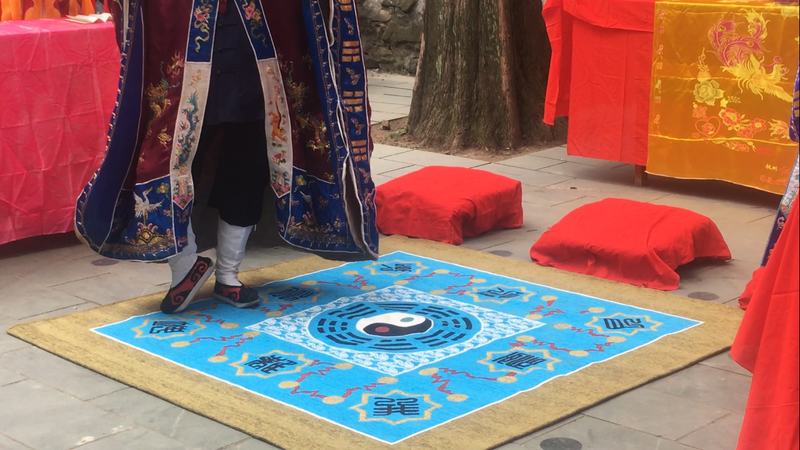 At the consecration of the new Jade Temple of Zhen Wu Da Di, Li Shi Fu invited a Mao Shan Pai Master to perform the Kai Guang Ceremony of “Opening the Light”, essentially an empowerment of the new statue devoted to Zhen Wu and his soldiers standing by his sides. Another honorable guest invited by Li Shi Fu to perform at the consecration was the Music Master who played the electric keyboard for the ceremony. The music accompanied the Mao Shan Pai Sorcerer who began to dance, stepping upon the marble floor within the Jade Temple, and then as if floating, he did a light leaping step up onto the altar, taking first a fresh towel, never used before, he washed the face of the statue of Zhen Wu, moving in the most eccentric way, as if coiling like a dragon through his arms, shoulders and back, and hopping upon clouds. He then was handed a large calligraphy brush dipped in Red Cinnabar and proceeded to paint the eyes of the deity upon the face of the statue and upon the 3rd eye Yin Tang “Hall of Impression”. 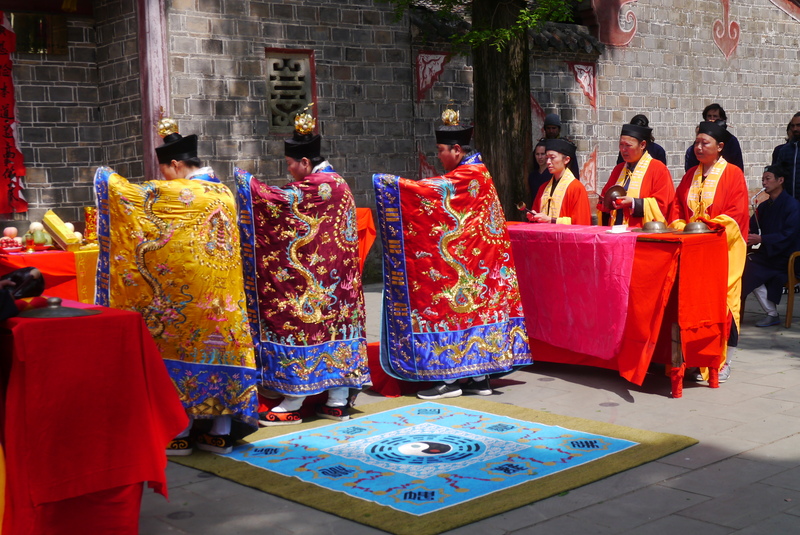 He was then handed a mirror to show the face of the empowered statue to Zhen Wu within it, holding up the mirror and then hopping lightly back down to the ground off of the altar. I remember there was a transmission in the quality of his movement. His movement was other worldly, as if a different creature, weightless, wild, eccentric; like flames waving, or smoke curling. I know this to be the spirit of Zhen Wu. I saw Zhen Wu again in the year 2017, on this most recent trip to China. This time I felt his presence through vibration and frequency. On the last 2 days of my month long trip, there was the auspicious fortune to be present for the Gao Gong Fa Shi “High Ceremony”, presented by Lineage Holder Gong Lao Shi, previously of the Purple Heaven Palace. 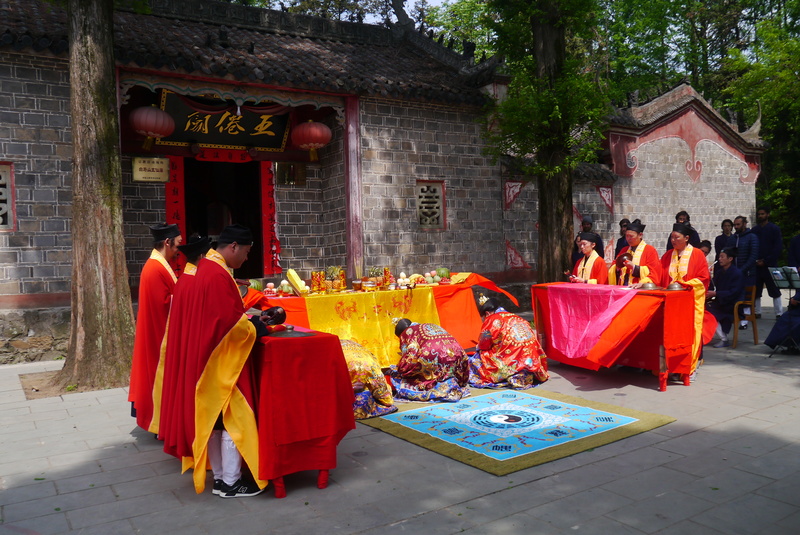 Gong Lao Shi taught many disciples the music, ceremony, talisman, hand seal and mantra practices of the Zao Wan Gong Ke “Morning and Evening Scripture” and Gao Gong Fa Shi. It was great destiny to meet her again and even have the chance to participate in the ceremony itself, as they happened to be missing one person in their group. This ceremony is over one hour long to perform, involves three main “dancers” who represent the Three Treasure Gods, or Three Stars, as well as six accompanying percussionists and singers, one drum/flute master, and two to three musicians in the band to play instruments such as the gu zheng (zither), pi pa (lute), er hu (fiddle) and more. I played one of the six percussion parts, holding the fa qi “magical instrument” of a small bell. The instruments are referred to as magical and are treated with great respect. When holding them, one feels this magic or consciousness of the instrument demanding the strict rhythm and sound to be maintained. All of the sounds, whether from flute, cymbals, wooden fish or vocals are all part of the conjuring of entities and achieving a specific vibration and frequency in the energetic field of the ceremony. The instruments and their sounds can also affect and heal the organs of observers or bystanders who are present and within the field of the ceremony. Through incantation and spell casting via various implements such as incense, water, planchette, sword, and the burning of prayer paper, the ceremony becomes like a vast equation or puzzle of elements aligning to create the possibility for higher entities to become manifest in this reality or human plane. I felt Zhen Wu arrive in the form of vibration that I could feel passing through my spine. He moved like a bee would, darting and hovering quickly through the space. That same energy or spirit which I had felt at the consecration of Zu Shi Dian, of wild eccentricity, other-worldliness, was present again. 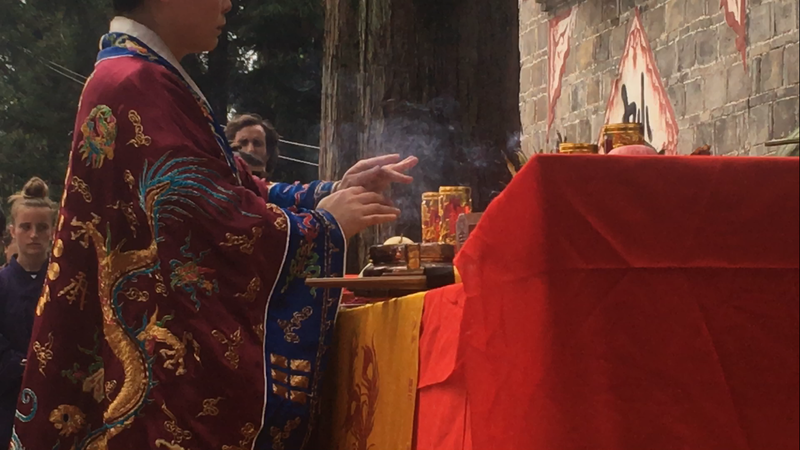 Around this time in which Zhen Wu arrived, we were approaching the end of the ceremony and Gong Lao Shi had agreed to do a Kai Guang “Opening of the Light” on a Turtle Snake statue I had bought for the altar of my school in America. The lead dancer took the calligraphy brush, dipped in cinnabar, from the incense burner where it had been throughout the ceremony, and began to paint the eyes red on the snake and turtle, also marking with red the third eye on both animals, and the fingernails of the turtle. She also moved with a type of flitting lightness and circularity through the hands resembling the way smoke curls and unfurls. I felt the presence of Zhen Wu, that spirit, that vibration, enter into the statue and look out from those eyes of the turtle and snake. 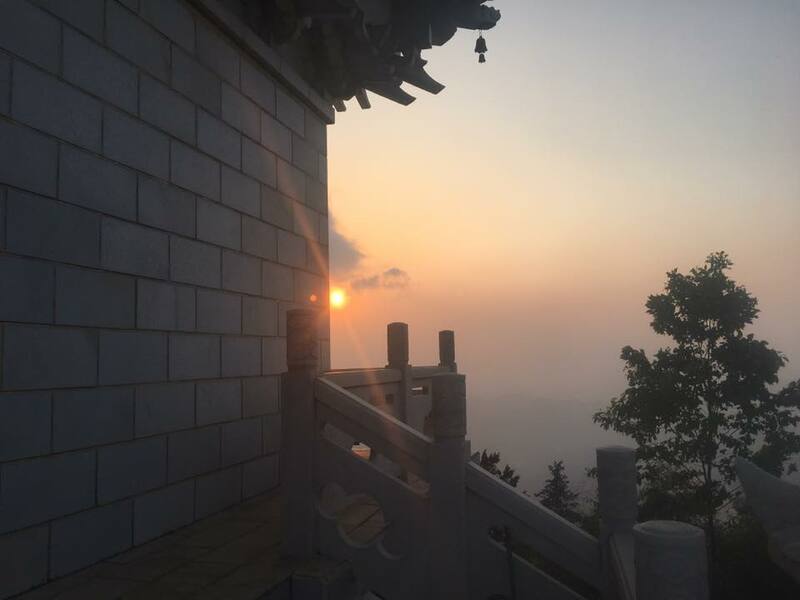 And those are the reports of two encounters with the God of the Northern Heavens on the Heavenly Horse Peak of White Horse Mountain in Wudang, China. Da Ci Da Bei. Wu Liang Tian Zun. Great Mercy, Great Compassion. The Immeasurable Heavenly Lord.